Great for the fisherman in your life and a fun project for kids! What You Need: 1 cupcake; icing tinted blue; stick pretzel; goldfish cracker; white writing icing. How to Make It: Frost cupcake. Place pretzel on top at an angle. Add fish about to be “caught.” Use white icing to “draw” a fishing line connecting the pretzel pole and the fish. 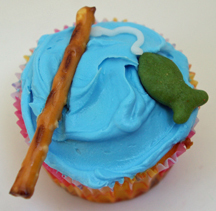 This entry was posted on Wednesday, April 2nd, 2008 at 8:24 am	and is filed under Father's Day cupcakes, ocean and sealife cupcakes, sports cupcakes. You can follow any responses to this entry through the RSS 2.0 feed. Responses are currently closed, but you can trackback from your own site.